Book your honeymoon with Virgin Holidays at our Cheshire Wedding Fayre and receive 10% off your booking! Only on the day of the Macdonald Craxton Wood Wedding Fayre, Sunday 16th September, 12-4pm. Weddings as unique as you are! We are delighted to have Virgin Holidays exhibiting with us at our Cheshire Wedding Fayre on Sunday 16th September at the Macdonald Craxton Wood Hotel & Spa. 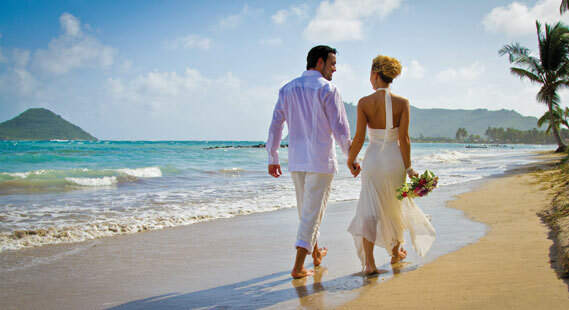 They will be offering couples advise on their amazing weddings and honeymoons abroad! From the grandeur of Niagara Falls to the sights from a helicopter over Las Vegas, experience a special day that you, your finance and your guests will never forget. Check out our unique weddings here, their expert weddings team will be on hand to recommend the perfect hotel to make your Wedding and Honeymoon unforgettable! It all starts with an open heart. A sense of adventure. And now the same appetite for life that brought the two of you together has brought you here. You’re in great hands. At Virgin Holidays, we know a thing or three about throwing a party, and we’re downright expert at understanding what makes a perfect destination wedding or celebration. We know some extraordinary places, from sweeping bays of snow-white sands, to safari lodges perched above rolling savannah, through to an insider’s NYC and the va-va-voom of Vegas. And we know that every couple’s budget and wishlist is different. It’s why we’ve worked with like-minded resorts and hotels all over the world to offer a range of packages for every taste. Their amazing special offer is 10% off when booking your honeymoon with them on the day of our Cheshire Wedding Fayre on Sunday 16th September! Enjoying your first adventure or relaxing holiday together as husband and wife has never been so easy with discounts like these! Exclusive only at the Macdonald Craxton Wood Wedding Fayre, Sunday 16th September, 12-4pm. Visit their stand and chat with their team on how to entered. Whether you are still looking to book your honeymoon or you are looking for more wedding ideas and wedding inspiration then come along on Sunday 16th Septemger to our Cheshire Wedding Fayre, for lots more exciting offers, catwalk shows, lots of wedding goodies and freebies, live music and so much more. We will have everything you need to plan your wedding all under one roof. Put the date in your diary and join us and enjoy an afternoon of wedding planning and shopping! Amazing offers from Glamour Events Hire when booking their selfie mirror and arcade games on the day of the Craxton Wood Wedding Fayre! Glamour Events Hire will be exhibiting at our Cheshire Wedding Fayre on Sunday 16th September, they will have an amazing Selfie Mirror Photo Booth for you and your bridal party to have fun in as well as their games and entertainment you can hire to make your wedding day even more enjoyable!! 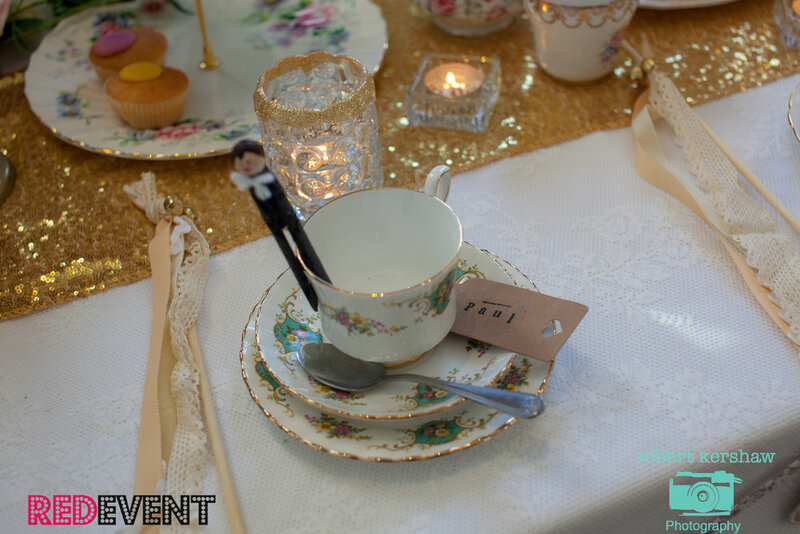 Why not bring the fun of classic, retro and new games to your wedding! Glamour Events Hire have an amazing selection of giant games available to hire. 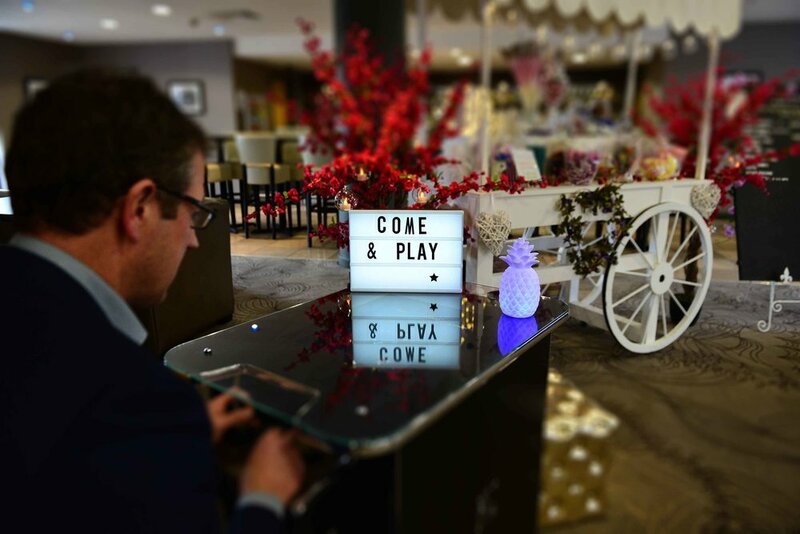 Their lawn and fairground games bring great entertainment for your guests during the summer months, these include tug of war, croquet and jenga to name but a few! For the winter months, why not treat guests to some indoor old school fun in the form of a two player sit-down eighties arcade machine complete with Pacman, space Invaders and Donkey King - The graphics may not be 3D but kids today as well as adults will love to play them. Visit their stand on Sunday 16th September, grab a prop and strike a pose in their selfie mirror with your bridal party and why not have some fun and try out their games! Come along to our Cheshire Wedding Fayre at the Macdonald Craxton Wood for this fabulous offer and many more to be announced! Watch this space! 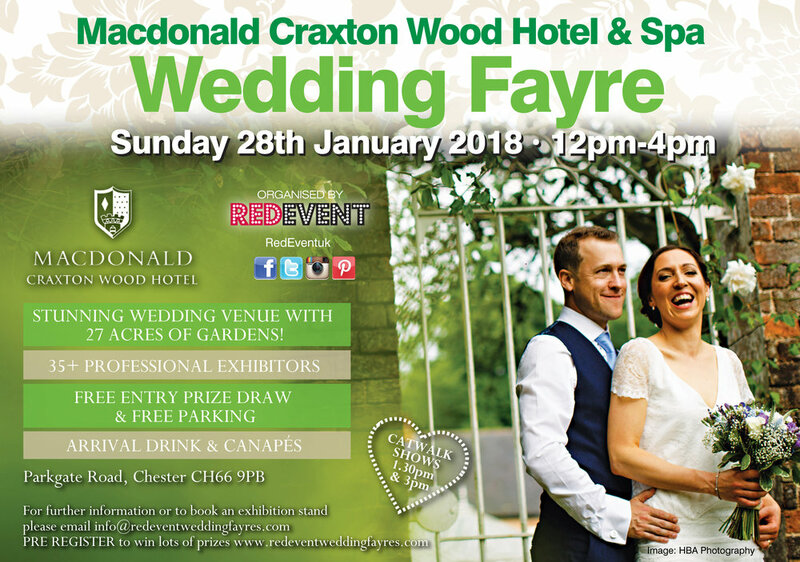 It's been a couple of months since we hosted the Macdonald Craxton Wood Wedding Fayre and already we are looking forward to our next Wedding Fayre! 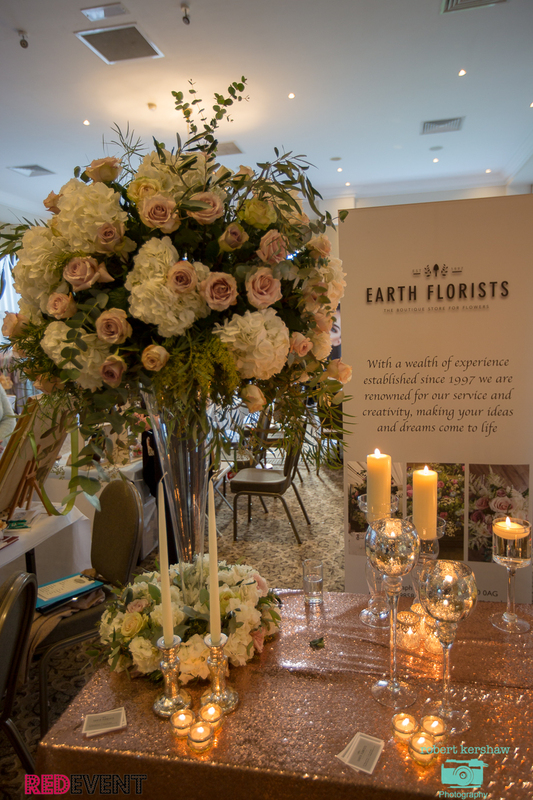 Earth Flowers exhibiting their stunning floral arrangements and. 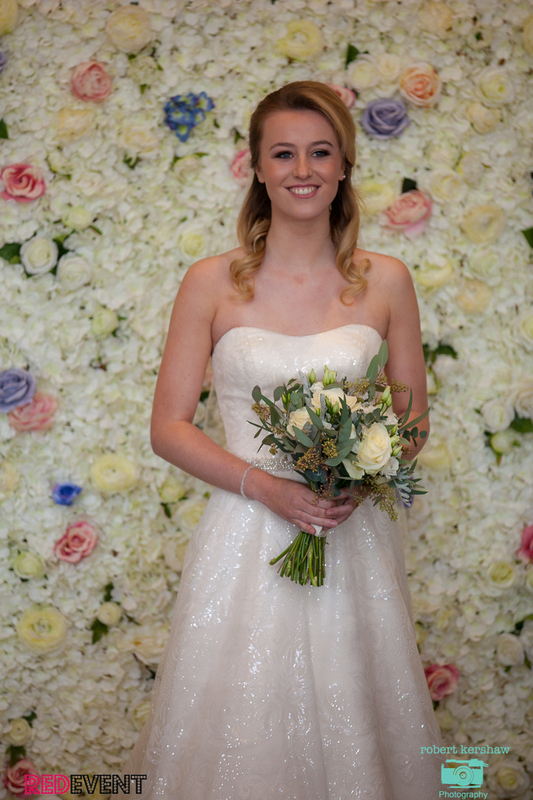 Below also Showcasing their bridal bouquets on our catwalks shows. 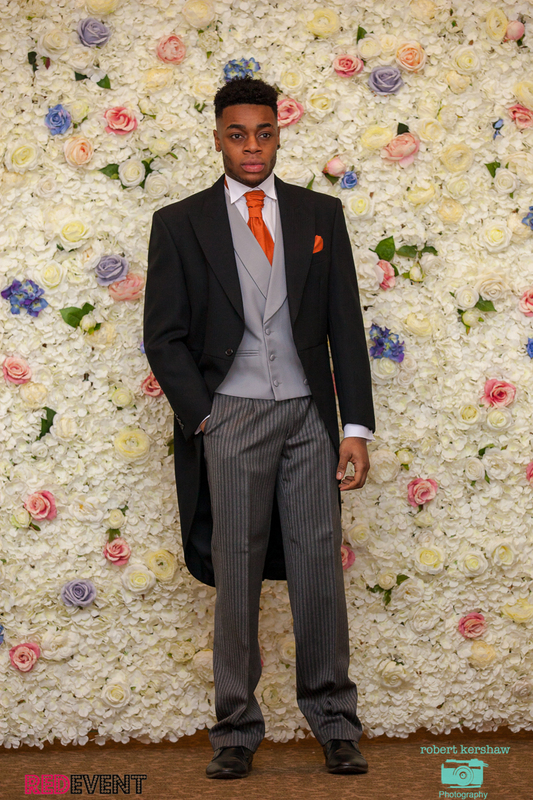 We absolutely loved the stunning floral back drop from Original Decor, if it was good enough for Kimmy and Kanye's Wedding then it was certainly good enough for our catwalk shows! 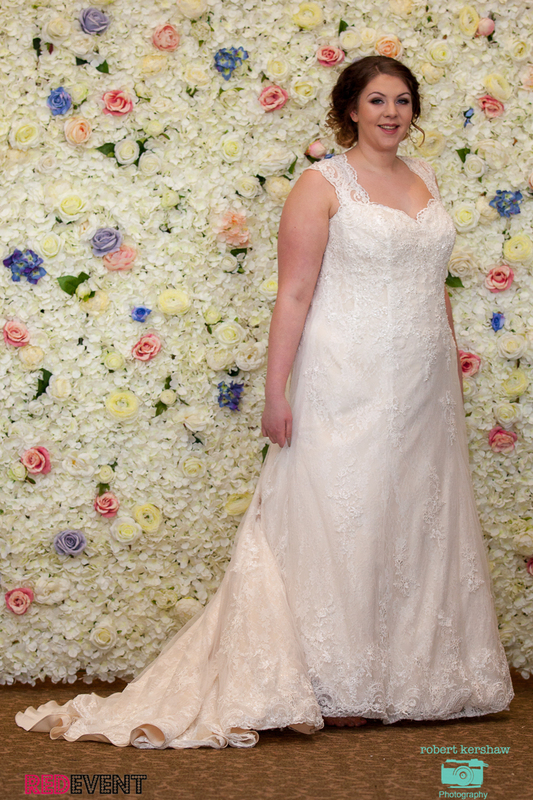 A perfectly pretty backdrop for our models who wore Maggie Sottero, Christina Wu and Rebecca Ingram from the fabulous shop Elegance Bridal .Elegance offer a wide range of bridal dresses from size 8 up to size 24 catering for all shapes, sizes and styles. Rigby Jewellers a family run business based in Chester exhibiting their amazing wedding bands and engagement rings. 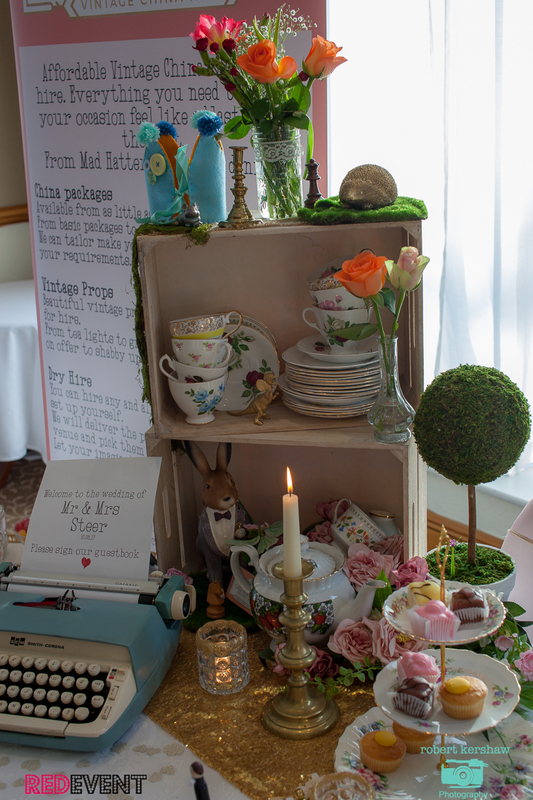 CoCo Vintage Collection had lots on offer for the quirky bride, from props, vintage crockery hire, table dressings and lots more there was lots of inspiration for a vintage themed wedding! Aesthetics Inc offering brides advice on their Aesthetic and Beauty services ensuring brides look and feel their best on their wedding day! For the creative bride visiting ARK Jewellery Design's stand was a must! 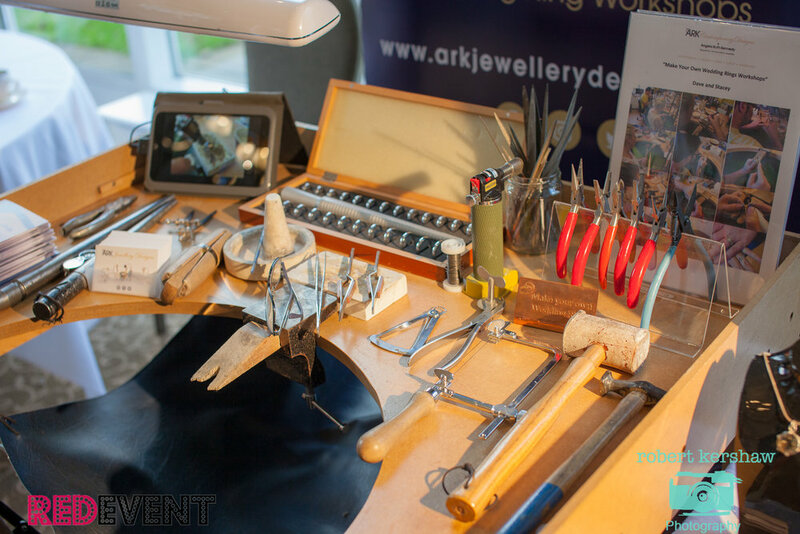 Angela is silversmith and can offer 'Make your Own Wedding Ring' workshops, a truly unique and bespoke way of making your ring for your partner in one day! Such a special and thoughtful idea that brides and ourselves loved! Couples enjoyed Booth tubes interactive 'snapchat' photo booth, couples and bridal parties stuck a pose using digital props and 'instagram filters', guests had endless fun taking stunning photos, creating online gifs and could instantly social share their creations to Facebook, Twitter, Email or SMS text message directly from the booth. A New style of photo booth that came over all the way from America! Bridals and our bridal models enjoying make overs by the super talented Sarah from She's Prem. 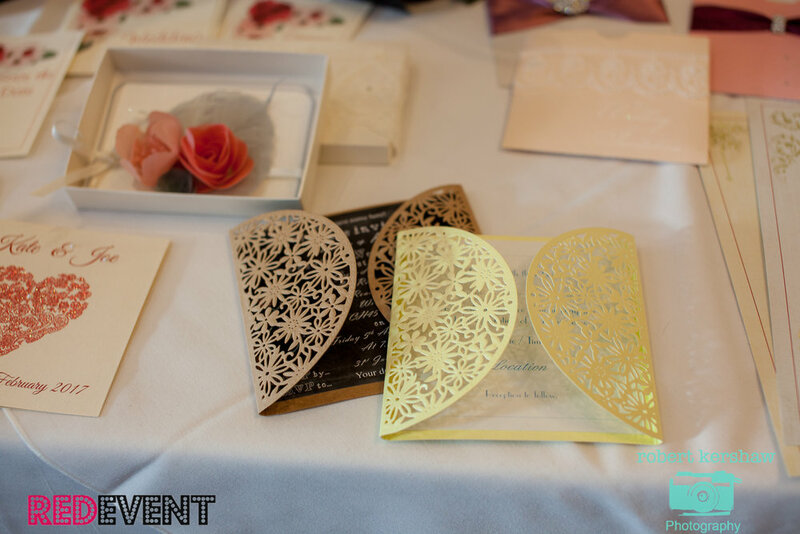 Beautiful bespoke invitations and stationery from RoseVert Designs! Mother's of the brides and groom shopped for their hats, outfit, shoes and accessories offered by Classy Chic! 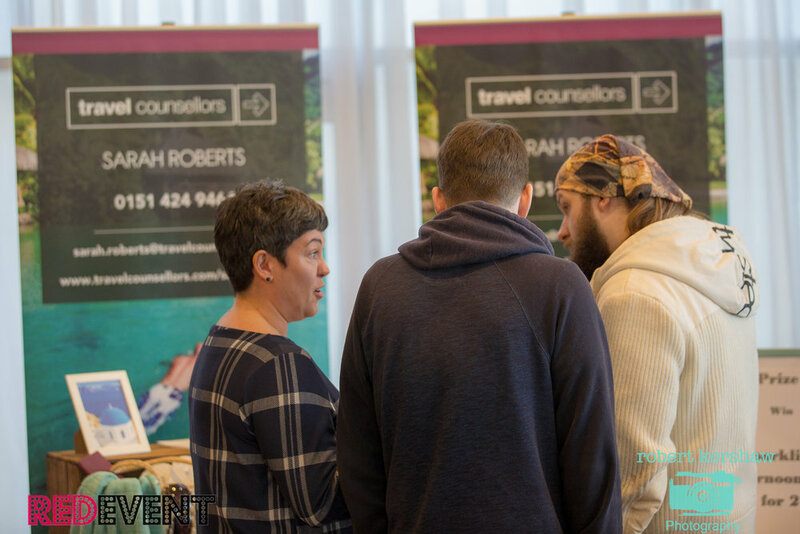 Sarah from Travel Councillors offering travel and holiday advice for couples looking to get married abroad or planning their dream Honeymoon. Always a popular stand for chocolate lovers, we could not keep away from Heavenly Melted Chocolates tasty treats and chocolate fountains!!! Our Beautiful model Georgia enjoying a photo shoot in front of Original Decor's Floral back drop. 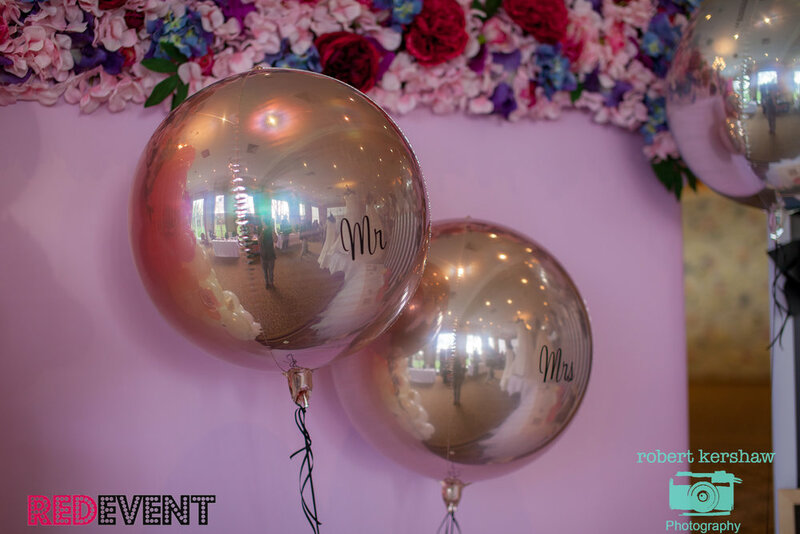 Original Decor exhibited balloons and different backdrops available to hire for your wedding day! Perfect for your wedding ceremony back drop or your wedding photographs! 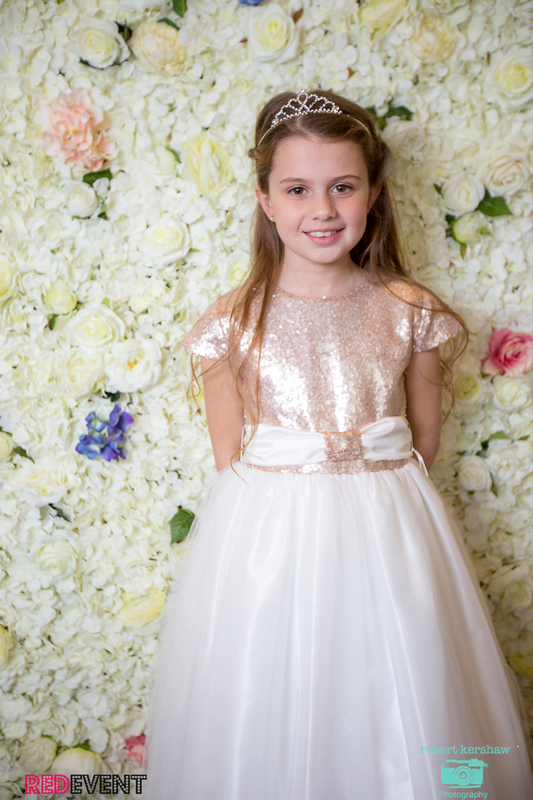 Our little cutie flower girl Daisy modelling a dress from Tara Lee Bridal. Gloria from Tara Lee offered advice and a bespoke service to engaged couples tailor making flower girl dresses. Their dresses were also showcased on our catwalk shows! Handmade Jewellery by Sandra Roberts offered bespoke jewellery for your bridal party, as a gift or treat for yourself. 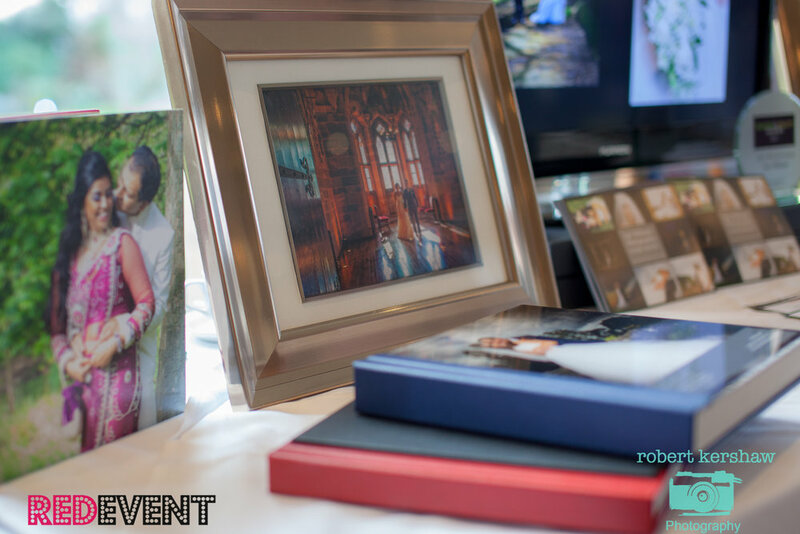 Robert Kershaw Photography and Ian Williams Photography exhibited their stunning wedding portfolios. Both offering couples a unique and different style to capturing your wedding day perfectly. 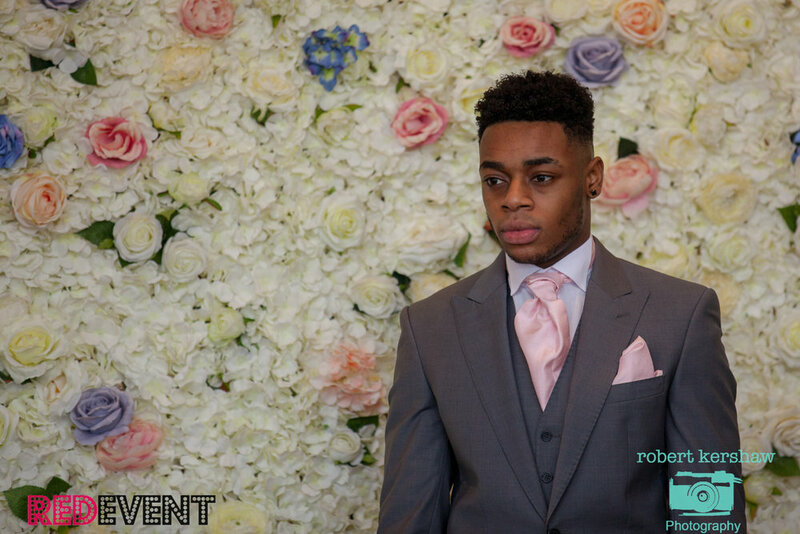 Young's Hire exhibiting and showcased their menswear on our catwalk shows modelled by Eden. 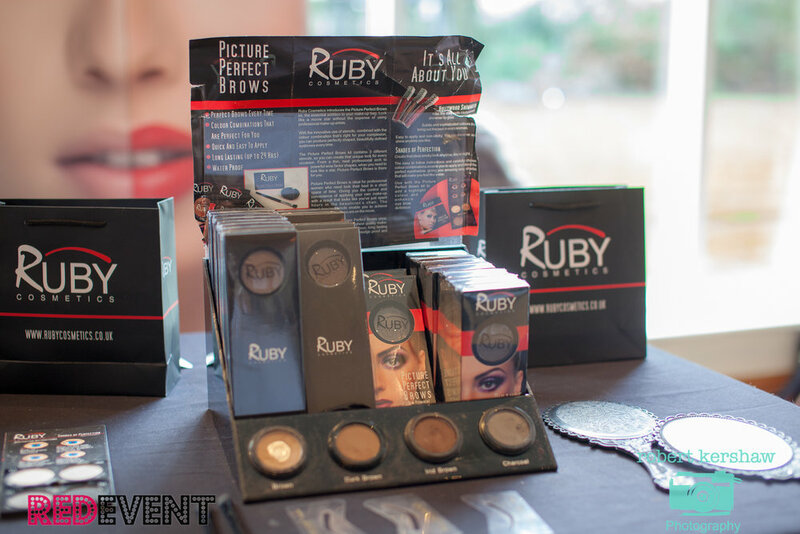 Long lasting make up was available to purchase on the day, the team at Ruby Cosmetics offered mini make up trials and deals on their popular make up range! Carrie-Anne from Hair at Home showcased her different wedding hair trends on our beautiful models, finishing the overall look perfectly. 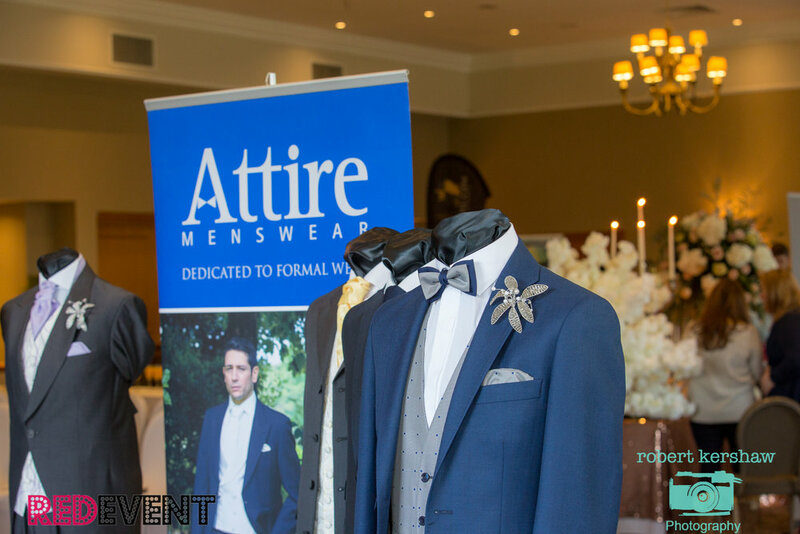 With special thanks to all involved in our catwalk shows and to Robert Kershaw Photography for capturing our wedding fayre! 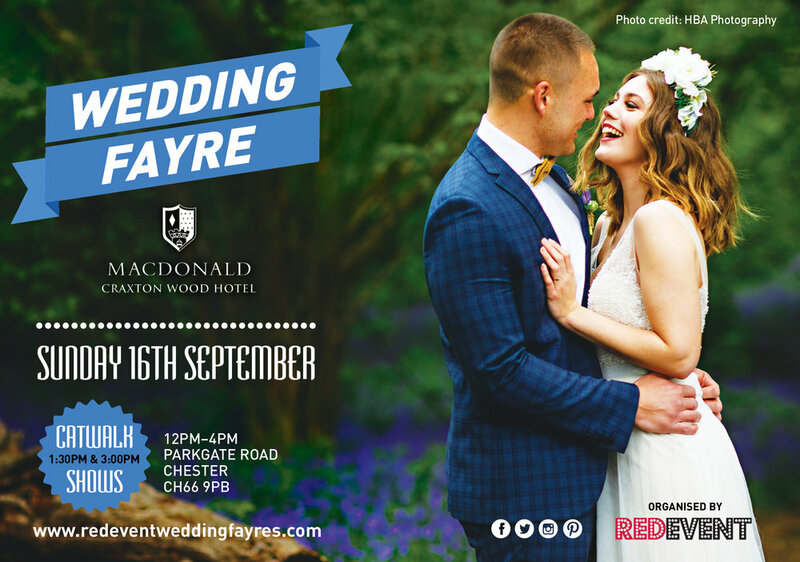 Save the date for our next wedding fayre as we will be bringing you our 5th edition of the Red Event Cheshire Wedding Fayre on Sunday 16th September, 12 - 4pm at the stunning Macdonald Craxton Wood Hotel & Spa. With lots more wedding ideas and wedding inspiration for your to enjoy you won't want to miss it! For further information and to pre register (and be in with a chance to win a spa day for you and your finance, plus many more prizes) visit our event page here. We look forward to welcoming you! Glamour Booth will be exhibiting at our Chester Wedding Fayre on Sunday 18th March, they will have an amazing photo booth for you to have fun in as well as their games and entertainment you can hire to make your wedding day even more enjoyable! 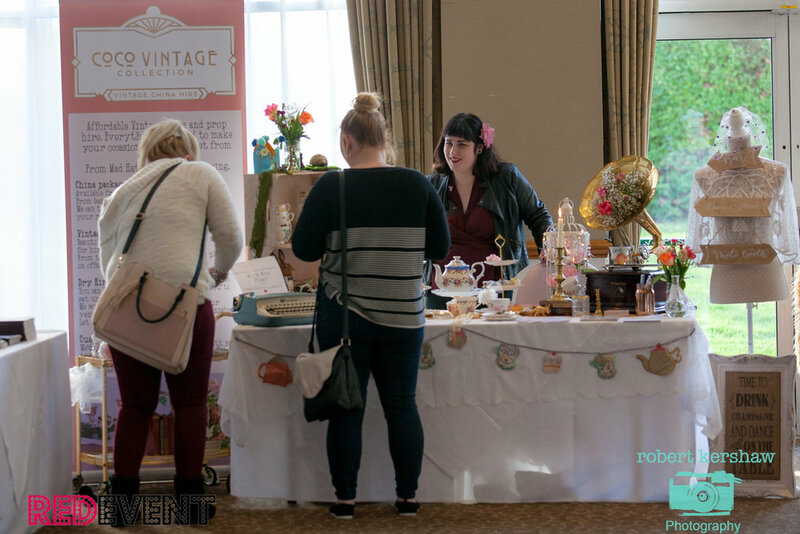 Their Candy Cart products are ordered to match your event – So from Vintage to 70's Disco, From Disney to Hollywood Glamour they ensure your cart is decorated to match your personal style. Luxury to Haribo Fav and did we mention retro childhood favourites – YOU choose the menu we provide the scenery! For further information on their yummy packages visit their website here. Why not bring the fun of classic, retro and new games to your wedding! Glamour Booth have an amazing selection of giant games available to hire. Their lawn and fairground games bring great entertainment for your guests during the summer months, these include tug of war, croquet and jenga to name but a few! For the winter months, why not treat guests to some indoor old school fun in the form of a two player sit-down eighties arcade machine complete with Pacman, space Invaders and Donkey King - The graphics may not be 3D but kids today as well as adults will love to play them. 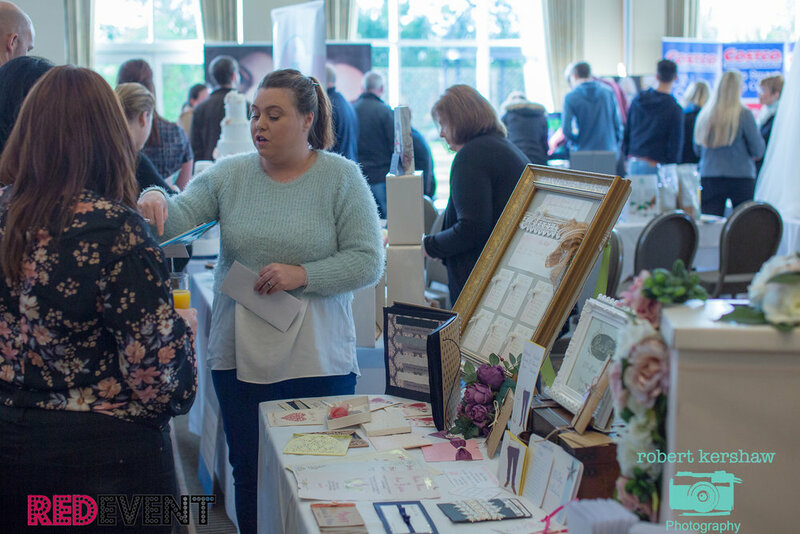 Glamour Booth's special show offer is 10% off when booking them on the day of the Brook Mollington Banastre Wedding Fayre on Sunday 18th March, 12 - 4pm! Visiting their stand, grab a prop and strike a pose in their photo booth with your bridal party and why not have some fun and try out their games! Come along to our Chester & Cheshire Wedding Fayre at the Brook Mollinton for this fabulous offer and many more from our wedding suppliers! Free entrance! Rojers Jewellery specialises in designing and hand making beautiful bespoke wedding rings, diamond engagement rings and other fine jewellery. Roger has over fifteen years experience working as a Master Goldsmith and Diamond Setter and prides himself on his high level of craftsmanship, personally designing and creating all wedding rings to compliment your engagement ring. 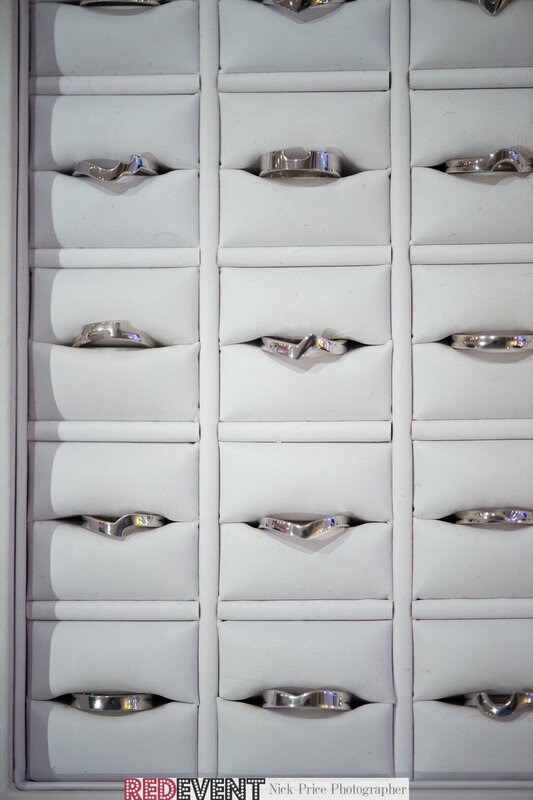 They offer professional and friendly advice to ensure you choose your perfect wedding rings! Rojers Jewellery exclusive 'on the day offer' is 10% off your wedding ring order when you book an appointment on the day of our Chester Wedding Fayre at The Brook Mollington Banastre Hotel & Spa on Sunday 18th March, 12 - 4pm. 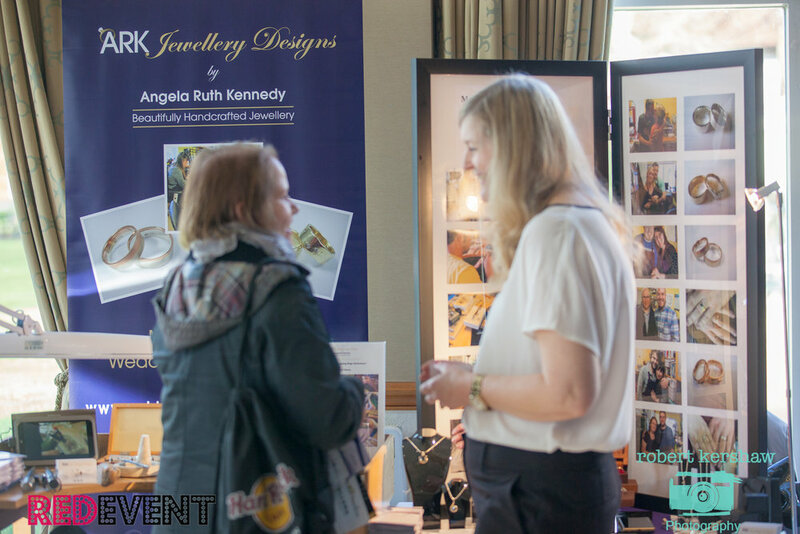 Browse through their website or Facebook business page for examples of the type of jewellery that can be created and come along to our wedding fayre and see their jewellery on our catwalk shows! 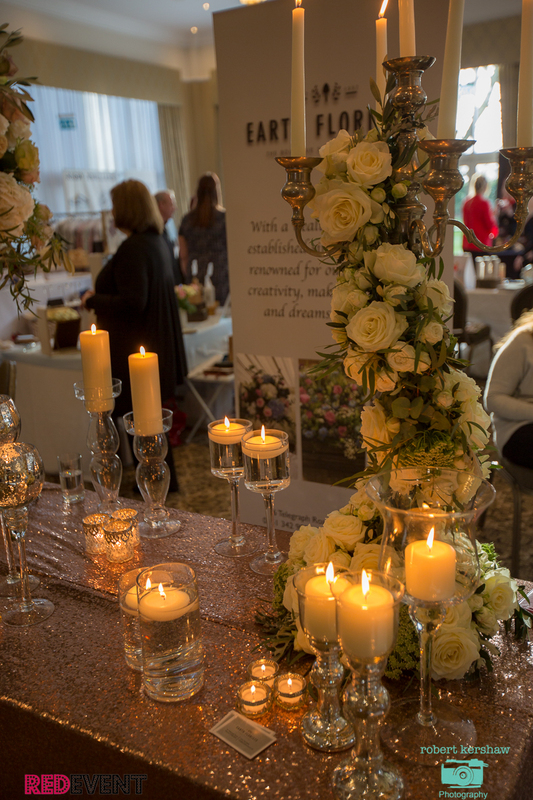 Whether you are looking for your wedding rings or for more wedding ideas & inspiration, come along to our Chester Wedding Fayre on Sunday 18th March and chat with the Wedding Team at the Hotel and over 30+ Professional Exhibitors over a glass of fizz and canapés! Watch our catwalk shows at 1:30pm & 3pm featuring Bridal, Bridemaid and Menswear and the stunning jewellery from Rojers Jewellery! Kev Dunn Magician is an award winning Magician from Liverpool and a member of the Liverpool Magic Circle who provides the best in magical entertainment for your wedding day! He has recently been awarded Close up Magician of the year by Liverpool Magic Circle and will ensure your wedding day is magical and your guests kept entertained! 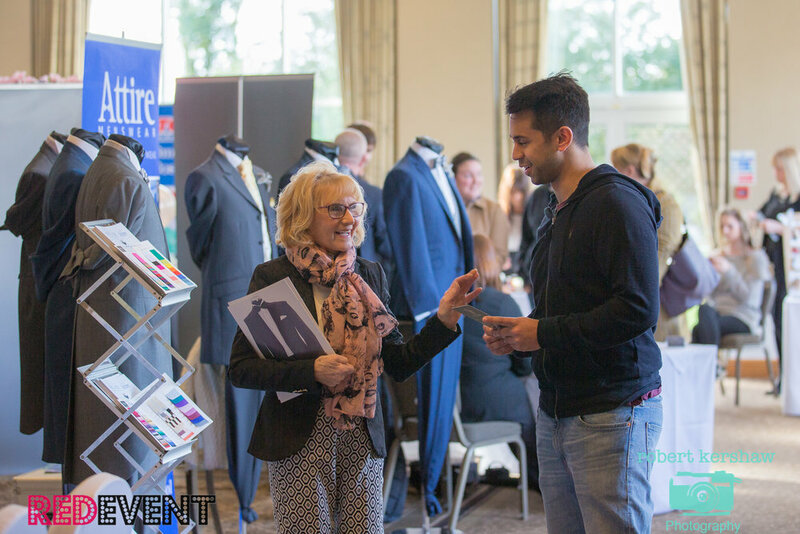 His special offer for any couples booking him on the day of the Holiday Inn Ellesmere Port Cheshire Oaks Wedding Fayre is £50 discount off his close up magic a *£50 deposit is required to secure your offer. Come along to our North West Wedding Fayre based on the beautiful Shropshire Canal on Sunday 4th March and visit Kevin's stand to receive this offer and talk him through your wedding. He can explain how he can make it an unforgettable experience for you and your wedding guests. We will have live music on the day, more amazing special offers like these, lots of free prizes to be won in our free raffle, stunning catwalk shows at 1:30pm & 3pm so much more! Come along and be inspired! Glamour Booth will be exhibiting at our North West Wedding Fayre on Sunday 4th March, they will have an amazing photo booth for you to have fun in as well as their games and entertainment you can hire to make your wedding day even more enjoyable! Glamour Booth's special show offer is 10% off when booking them on the day of the Holiday Inn Ellesmere Port Wedding Fayre on Sunday 4th March! Visiting their stand, grab a prop and strike a pose in their photo booth with your bridal party and why not have some fun and try out their games! Come along to our North West Wedding Fayre at the Holiday Inn Ellesmere Port Cheshire Oaks for this fabulous offer and many more to be announced! Watch this space! Rigby Jewellers of Chester will be exhibiting at The Macdonald Craxton Wood Wedding Fayre on Sunday 28th January. Rigby Jewellers is a traditional, family business and a member of the National Association of Jewellers and recognised as one of Cheshire's prime jewellers. Rigby Jewellers of Chester sees Jason as the 4th generation to enter the retail jewellery scene and as part of this independent family jewellery business. Forging a strong partnership alongside his father; combining both knowledge and experience with youth and enthusiasm, the continuity of Rigby Jewellers as one of Chester's prime independent jewellers is assured. They are offering 10% vouchers to Brides & Grooms on the day of our Chester Wedding Fayre. Be sure to speak with Jason and view their stunning range of Wedding Rings and to redeem your voucher! Glamour Booth will be exhibiting at our first wedding fayre of the Spring season on Sunday 28th January, they will have an amazing Candy Cart on show as well as their games and photo booth! Glamour Booth's special show offer is 10% off when booking them on the day of the The Macdonald Craxton Wood Wedding Fayre on Sunday 29th October! They have also donated a Free Custom Designed Template and Ginger Ray Guestbook with Booth Purchase into our on the day free prize draw. 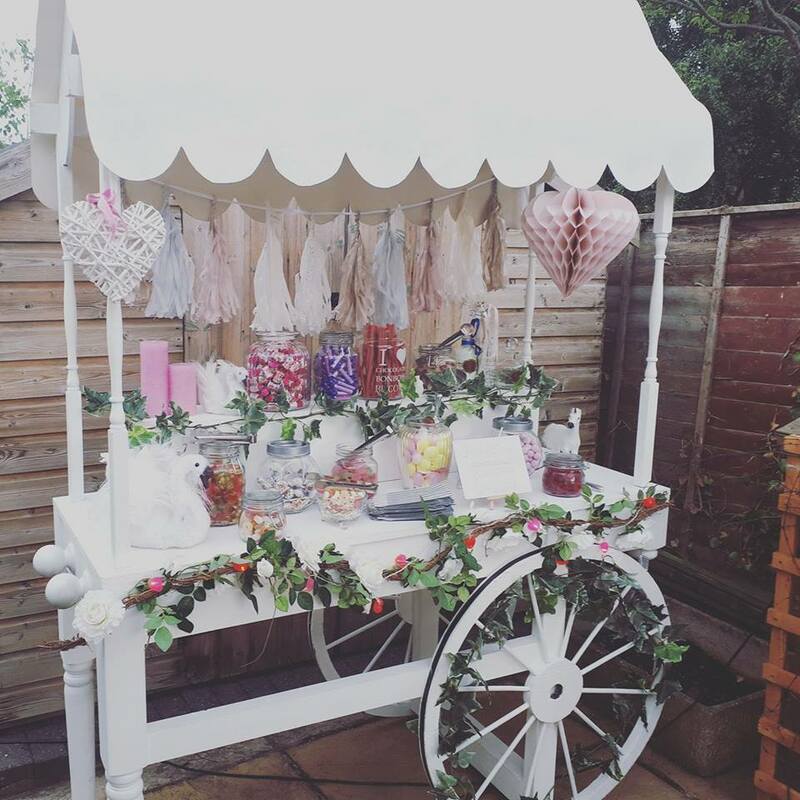 Visiting their stand for sweety treats, enjoy fancy dress in their photobooth with your bridal party and why not have some fun and try out their games! Come along to our Chester & Cheshire Wedding Fayre at the Macdonald Craxton Wood Hotel & Spa for this fabulous offer and so much more! Save the date for Spring 2018 Wedding Fayres! Enjoy a peaceful canal side wedding at this unique and tranquil waterfront setting. A perfect location for your wedding day! 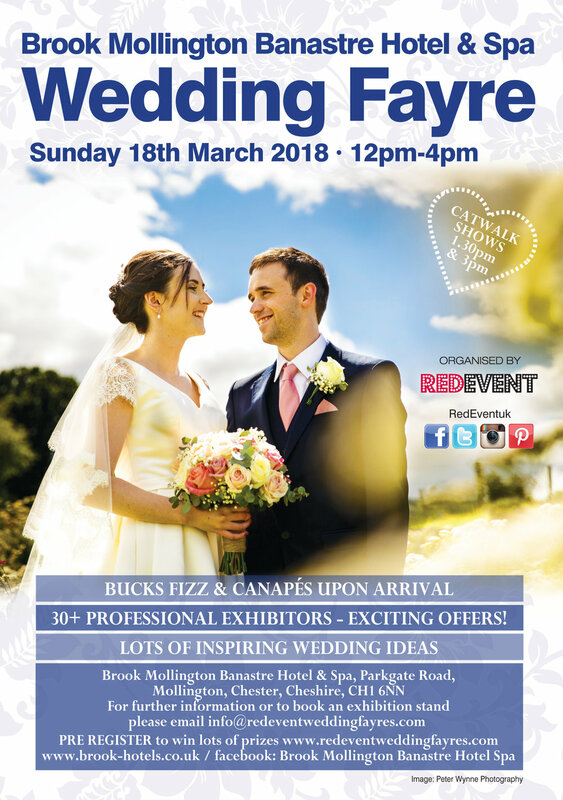 Come along for an afternoon of wedding shopping and wedding planning and chat with the friendly staff about your wedding ideas and wedding requirements! For further information visit our event page here. 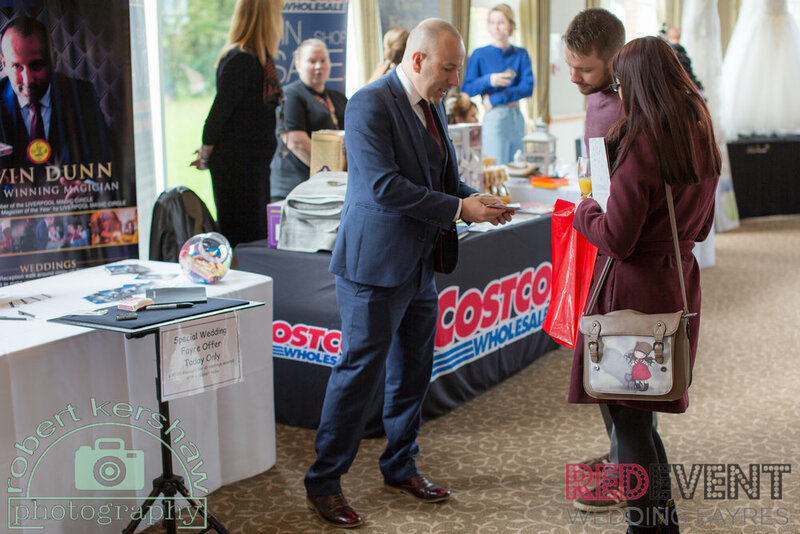 Join us at this Chester Wedding Fayre at the Traditional 4 Star Country House set in the Cheshire Countryside for an afternoon of wedding planning and wedding shopping! We will have everything from cakes to menswear, wedding cars a HUGE designer dress sale (with changing rooms) and all the very latest in wedding trends and ideas plus so much more! For further information visit our event page here.